Zak whipped up this simple, yummy breakfast this morning (confession: technically it was this afternoon because we were out late last night and slept in until almost noon). I really loved the light heat of the jalapeños combined with the cool bite of the sour cream and warm creaminess of the eggs. Plus, it’s nice to have a really swell fiancé who helps with the cooking and cleaning and does such a darn good job of it. I’m a lucky gal. Heat canola oil in a large skillet over medium-high heat. Add onion and cook until tender, 6-7 minutes. Add potatoes and jalapeños and cook, stirring occasionally, until browned, roughly 10-15 minutes. Season with kosher salt and freshly cracked black pepper. Remove vegetables from pan and top with a dollop of sour cream. 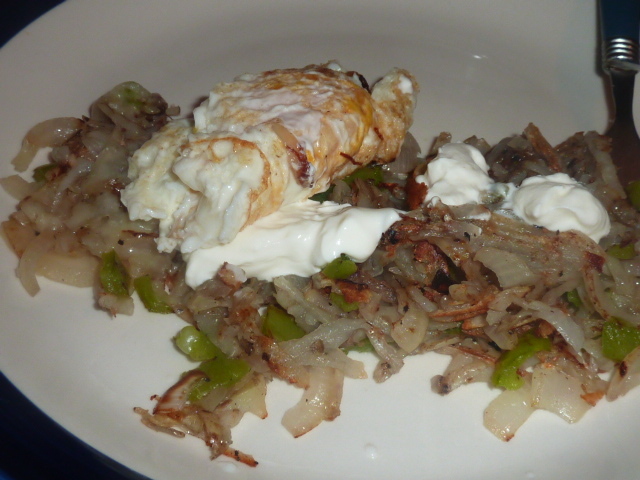 Crack eggs into pan and cook to desired consistency (pictured is over-easy). Top with mozzarella cheese. 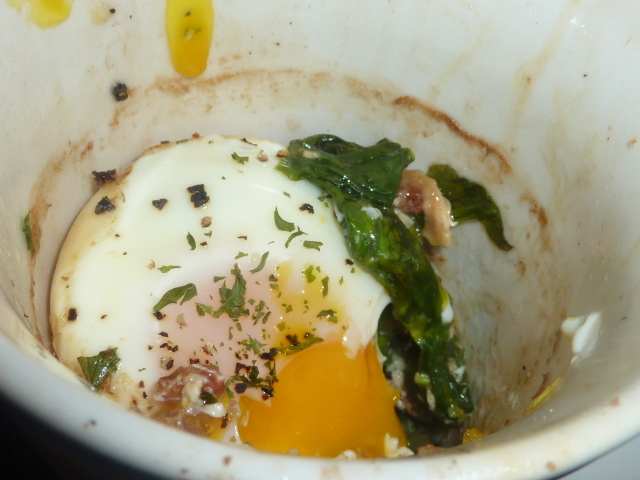 An egg en cocotte is an egg cooked individually in cream or butter in a small ramekin. In this version, I did without the cream and substituted the butter for drippings from the cooked pancetta. It was a little tough to get a picture that did this delicious breakfast justice, since I cooked it in oven-proof coffee mugs rather than ramekins. This breakfast was filling, rich, and decadent and was just as easy as your standard fried-egg and bacon to make. In large skillet, sauté pancetta 5-8 minutes until crisp. Remove meat from the skillet and place on paper towel to drain. Use a pastry brush to brush the insides of your vessels with some of the pancetta fat from the skillet. Add romaine to the heated skillet and toss to coat with pancetta fat. Season with freshly cracked black pepper. Sauté 4-5 minutes until wilted almost completely. Add half of romaine to each of your two serving vessels. Top with half of pancetta in each serving vessel. Using a spoon, create a small depression in each of the vessels. Carefully crack an egg into each depression. Place serving vessels in oven and bake for 15-18 minutes or until whites are set. I cooked mine for 15 minutes and they were slightly runny, which was perfect for us. Remove from oven and top with dried parsley. Serve with a slice of whole wheat toast. I burned my fingers like HELL making this dish due to an instinctive reaction upon seeing my dog putting his head suspiciously close to the open oven. It’s a little painful typing this to be honest, but … it was worth it. A couple weeks ago, I had never made a frittata, but they are so versatile I’m sure I’ll be making them again and again. All of these flavors worked together well and the addition of the tomatoes and cheese made this an extremely robust, filling meal. Boil a small pot of salted water. Add chopped potatoes and cook until slightly tender, 6-8 minutes. Drain. Heat 2 tbs. olive oil in a large skillet over medium-high heat. Add cooked potatoes, white onion, garlic, red bell pepper and mushrooms and cook until all vegetables are tender, stirring frequently, roughly 10 minutes. Stir in 2 tbs. flour and baking soda. Transfer to a bowl and add chopped parsley. Let cool to room temperature. In a small bowl, whisk eggs. Add to vegetable mixture and stir well combine. Add 3/4 cups of cheese and combine. Spray your casserole dish liberally with non-stick cooking spray. Coat the sides and bottom of the baking dish well with the extra 2 tbs. of flour (use more if necessary). This will form a light “crust” for your fritatta, so try to make it as uniform as possible and be sure it extends to at least where your vegetable-egg mixture will fall in the casserole dish. 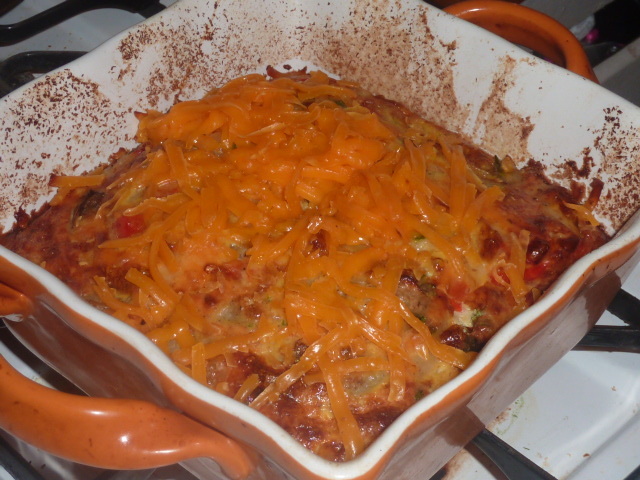 Pour the vegetable-egg combination into your casserole dish and use a spoon to make sure it’s even. Bake in oven, uncovered, for 30-40 minutes until eggs are set. Add remaining cheese to top and let melt, roughly another 5-8 minutes.